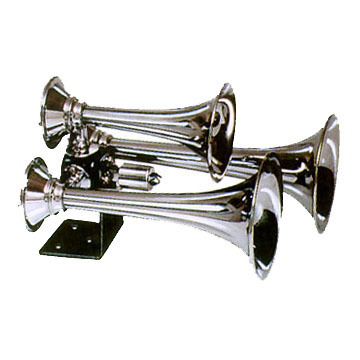 All metal Chrome Plated Triple Train Horn. If you want a big BLAST, then this horn kit is for you! This is the real deal and is Dangerously loud! This horn kit features a steel mounting bracket, three chrome bells measuring 11, 14, and 16 inches. It also features a 12 volt air valve for maximum air flow! Purchase our viair compressor and tank kit to complete your air horn package! Other sites charge over $400 for lower quality horn kits!